Wasps Netball maintained their pressure on league leaders Manchester Thunder with a dominant 61-46 win against Team Bath. Mel Mansfield’s side were on top throughout the game, winning every quarter and capitalising on turnovers forced by their high-pressure defence. The win against top-four rivals Team Bath puts Wasps six points clear of fifth place with five games left of the regular season. Mansfield said: “That was potentially our best performance over the full 60 minutes tonight against really strong opposition. “We stuck to the gameplan and trusted it throughout, winning every single quarter which I’m really happy with. “I’m so pleased with the defence, they worked so hard to limit Bath all over the court and that made a real difference. “It’s amazing what a win does for the mood in the camp and to beat a top team in a pressurised game like this will do wonders for the players’ confidence. Wasps enjoyed a fast start to the fixture with Jade Clarke orchestrating play from the mid-court. Clarke continued to disrupt the opposition and spark attacks, linking up well with Katie Harris to create goalscoring opportunities. 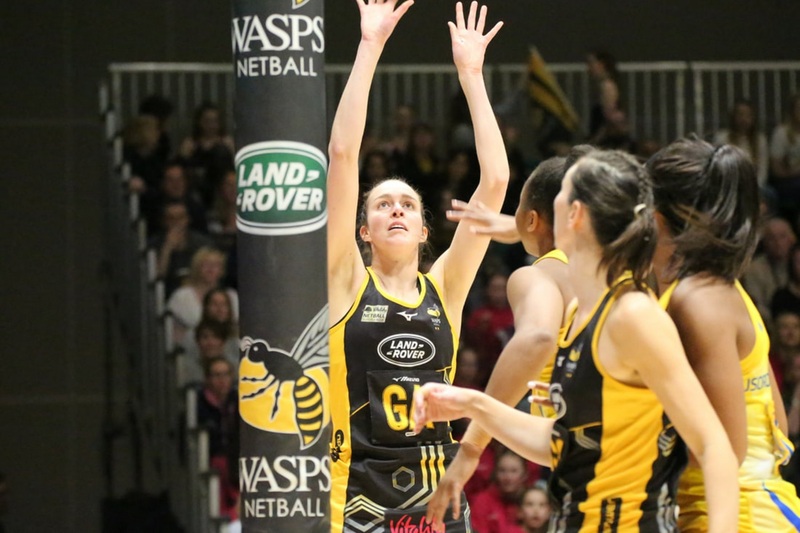 Rachel Dunn and Harris were in great form in the shooting circle, taking advantage of the chances developed by the Wasps mid-court – with Bath struggling to slow down Bongi Msomi. The Black and Golds did well throughout the first-quarter to limit the impact of Serena Guthrie, highlighted by a well-timed interception from Amy Flanagan. The home side continued to put the pressure on the visitors in the second-quarter, with Bath forced to move Eboni Usuro-Brown to Goal Keeper to combat the free-flowing Wasps attack. Wasps soon led by double figures but were immediately pegged back by Bath with two quickfire goals. Fran Williams worked tirelessly to shut down the Bath offence – nearly forcing turnovers on three consecutive attempts – yet the visitors were still able to score. Dunn continued her shooting clinic in the final possession of the half, scoring on the buzzer to extend her side’s lead to 11. Bath opened the second-half with two unanswered goals, but Williams was there again to halt their momentum with an interception. Dunn continued to win her battle with the Bath defenders, despite being put under pressure, and scored to maintain Wasps’ advantage. Bath struggled to rein in their hosts, as both sides went goal-for-goal, until the last three minutes when Wasps pulled out to a 14-goal lead. Josie Huckle and Tamsin Moala were introduced in the final-quarter as Wasps maintained their intensity to secure a 61-46 win.